You don't have to have seen many European movies to know that they have a vibe which is very different than their American counterparts. It would be very easy to say that their movies tend to feel more like art movies, but that would be very near-sighted. It is true that films from that part of the world often move at a pace which is slower than that to which we are accustomed and are much more likely to embrace bizarre, sometimes avant-garde ideas. This may sound bad to some American film fans, but there's no doubt that there are plenty of European films which are beautiful, moving, and fine examples of the cinematic arts. Still, it's very easy to go back to that word "different". The Hungarian film White God is decidedly different. Teenaged girl Lili (Zsofia Psotta) is forced to spend time with her estranged father, Daniel (Sandor Zsoter), when her mother goes on vacation. Lili clearly has not spent much time with this man (at least not recently) and there is definitely tension between them. Daniel is especially upset that Lili has brought her dog, Hagen, along with her, as he doesn't approve. And we quickly learn why. If someone wishes to keep a dog which is not a pure-bred, they must pay a fee. Daniel has no interest in doing this, and insists that Lili get rid of the dog. Lili is heartbroken as the loss of her best friend, to the point that she acts up at school. Meanwhile, Hagen is attempting to adjust to life on the streets. He meets some other wild dogs and learns to avoid the dog catchers. However, there are worse things than the dog catchers out on the street. Meanwhile, Lili doesn't give up her search for Hagen. Will the two ever be reunited. No matter what come to mind while you were reading that synopsis, you are wrong. White God is a movie which defies categorization and is almost impossible to synopsize. Writers Kornel Mundruzco, Viktoria Petranyi, and Kata Weber, with Mundruzco also serving as director (as well as appearing in the film), have crafted a movie which touches on nearly every genre. At the outset, it plays like a family drama, as we see Lili reunited with Daniel, and we watch the two attempt to get to know one another. This drama is elevated when Lili is forced to give up Hagen. Continuing with Lili's story, the film then becomes sort of a high-school movie, as we see Lili's behavior at school and her attempts to be noticed by an older boy. While this is going on, the movie begins to follow Hagen around the city. These scenes focus solely on the dog(s) and are mostly free from dialogue, save for when a human is attempting to catch Hagen. This is like the Hungarian version of Benji. Then, Hagen has a life-altering event, which changes the direction of the movie. 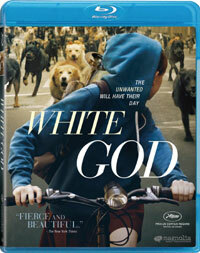 Finally, the third act...well, in the third act, White God suddenly becomes something like an apocalyptic horror film. Those who had come in hoping for a cute doggie movie will surely be shocked by this part of the movie. Having read that, it may not surprise you when I say that White God borders on being a mess. It's not that the film bites off more than it can chew. No, the problem is that it bites from too many sources. At one point, it looks like Hagen's life on the streets, where he makes some new friends, is going to mirror Lili's broken family, but the movie then spins off in several other directions. If the film had simply stuck to the story of Lili and Hagen's friendship, it would have been OK. It would have been like a lot of other movies, but it would have been OK. But, the movie insists on getting darker and weirder as it goes along, to the point that the finale feels like something that someone would have suggested in jest, only to have others like it and run with it. I can only imagine how difficult it was to stage the finale. If only it were satisfying. If possible, I try to find something positive to say about a movie, and for White God, it's that I can wholeheartedly recommend it for people who are looking for something the likes of which they've never seen before. For everyone else, you may want to think twice about this one. It's very slowly paced and the characters are often difficult to like, and that's on top of how bizarre the movie gets. The finale is the kind of thing which would have made White God the stuff of legend years ago, but the rest of the film is so lukewarm, that it's easy to understand why this movie hasn't become a "must see" amongst those who like alternative films. The movie is well-shot and the locations look great, but the film's overall lack of cohesion allow it to go to the dogs. White God is a title which I still don't understand on Blu-ray Disc courtesy of Magnolia Home Entertainment. The film has been letterboxed at 2.35:1 and the Disc contains an AVC 1080p HD transfer which runs at an average of 30 Mbps. The image is sharp and clear, showing only a hint of grain and no obvious defects from the source materials. The colors look very good, most notably reds, and the image is never overly dark or bright. The depth really makes you sit up and take notice during the finale and the level of detail ensures that the image is never soft. The Disc carries a DTS-HD Master Audio 5.1 track which runs at 48 kHz and an average of 1.6 Mbps. The track provides clear dialogue and sound effects. The stereo effects are good, as they allow us to hear sounds coming from the left or right of the screen. The many street scenes provide some nice surround sound effects, some of which offer individual sounds. The White God Blu-ray Disc contains a few extra features. "Behind the Scenes of White God" (17 minutes) offers interviews with the filmmakers and we see how the dogs in the film were trained. We then go on-set to see some of the scenes with the dogs being shot. "Interview with Writer/Director Kornel Mundruzco" (15 minutes) allows the filmmaker an opportunity to talk about the origins of the film and the production. We learn more about the animal action in "Interview with Animal Coordinator/Technical Advisor Teresa Ann Miller" (5 minutes) who is joined by one of the dogs who played Hagen. The final extra is a THEATRICAL TRAILER for the film.